Mr. Morio Ono, of Tamron Co., Ltd., announced that the company will release the AF18-250mm F/3.5-6.3 Di-II LD Aspherical (IF) Macro, a lightweight, compact and ultra high power zoom lens designed exclusively for digital SLR cameras with APS-C sized image sensors with a built-in motor for Nikon (Model A18N II). The AF18-250mm F/3.5-6.3 Di-II LD Aspherical (IF) Macro is the ultimate high power zoom lens boasting the world痴 greatest zoom ratio(*1) of 13.9X, a milestone that Tamron, the pioneer of high power zoom lenses, has achieved by commanding its technologies to further expand the capabilities of high power zoom lenses. (*1) As of November, 2007. 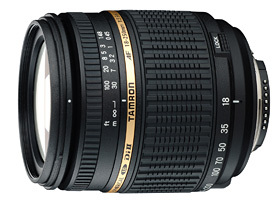 Based upon Tamron's research of lenses for exclusive use with digital SLRs equipped with APS-C sized image sensors.